After well-earned global acclaim for her riveting portrayal of Lisbeth Salander in the original film adaptations of Stieg Larsson’s best-selling Millennium Trilogy (which includes The Girl with the Dragon Tattoo), Swedish actress Noomi Rapace set her sights on Hollywood. 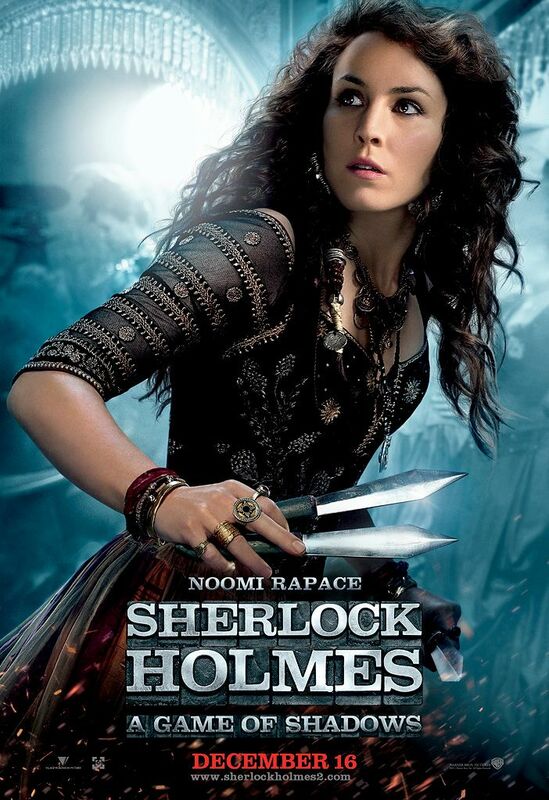 In her first English-speaking role (she learned how to speak the language only three years ago), she plays Sim, the mysterious Gypsy who allies with Sherlock Holmes (Robert Downey Jr.) and Dr. Watson (Jude Law) in their quest to stop Moriarty (Jared Harris), in Sherlock Holmes: A Game of Shadows (opening on December 16th). Question: As one of the newcomers to the franchise, what was it like to work with Guy Ritchie and adjust to his style of directing? Then, Warner Brothers wanted to send me over to London to meet Guy Ritchie. I was there for an hour. We talked, and it was also very intense. I came out of that meeting and I was like, “Whoa, I would love to work with those people!,” but I didn’t expect anything. I think it was a week or two week later, when they told me that they wanted me to do this role. Then, we started to shoot, three weeks later. So, I just jumped into it. It was super-intense and so much fun. I was really nervous, before shooting. It was my first English-speaking movie. I didn’t speak English until three years ago, so I didn’t really know how to deal with it or how it would be for me. The way Guy works, everyone was very open. It was very playful and easy and creative. It felt like he embraced my ideas, and it felt like we created this character together. I was surprised, the way they just opened their family to me, and I became one of the boys. The way Guy works, I don’t remember a single situation when I came on set and he said, “Okay, this is what I want you to do, exactly.” He always asked me, “How do you want to do this, Noomi? How do you see this? What do you think Sim would’ve done?” That’s pretty much the way I love to work, in a very searching, creative, open way. It was fantastic! What was the most difficult scene for you, either emotionally or physically? RAPACE: I like doing fight scenes and the more physical scenes, and I try to do as much as they allow me to do of the stunt stuff. I think that’s always quite easy. You just have to crack on and do it. Of course, you’re bruised and your body is aching, and you hurt yourself a lot, but that’s a part of it. I’ve done fight scenes and stuff like that before, and I always find it quite amusing. I think that the emotional scenes are more difficult. When my character loses a person that she really loves and she feels guilty for letting him down, that was quite complicated because you need to really get into that situation. There were a lot of people around me, and everybody was watching. You feel like you just want to hide and do it really privately, but of course, you need to do what’s real, in the situation. I think it’s always the emotional situations that are more tricky to nail and get into because I don’t want to pretend. Weirdly enough, I don’t like to pretend. I try to use things in me, and translate them into the situation and the characters, so it always needs to run through my own veins. It was the emotional scenes that were more difficult to find because I’m really self-critical and I don’t want to pretend. What has your Hollywood experience been like? Is it a dream come true for you? RAPACE: Well, I think I’m really spoiled now. This was the first American movie and the first English-speaking movie I did. I didn’t know what to expect before, but the way these people worked, and the way we worked together, was just amazing. It felt like we went on this journey together. It felt like me and Robert and Jude came closer and closer, during filming. It was really fantastic. I’d heard that you wait around and you sit in your trailer, then you go in and do something, and then you go back to your trailer and wait, but I don’t remember waiting, at all. I was extremely happy. And then, I went, amazingly enough, straight into working with Ridley Scott. I started to prep Prometheus straight after, and I was in that movie for five or six months. It was a really intense year. I’m really grateful for the people that believed in me and gave me the chance and invited me to take this journey. I’m extremely grateful and proud. Had you always had the goal of branching out to American films, or did you just want to see what opportunities were available, after the attention you received with The Girl with the Dragon Tattoo? RAPACE: I grew up watching American movies. My favorite movies have always been American, since as long as I can remember. I loved Dog Day Afternoon, The Godfather, Carlito’s Way, Scarface, Raging Bull, True Romance, Thelma and Louise, Alien and all of those movies. I always had this huge respect for American filmmakers and American actors. Al Pacino, Meryl Streep, Robert DeNiro and Sean Penn are my favorites, and the ones I always go back to. I watch their work, over and over. So, I always had this very strong love and respect for the American cinema. I always knew that I was going to leave Sweden. My mom said to me, just a couple days ago, that when I was nine, I said, “I’m moving soon.” I knew that I wanted to fly away. I always felt like, “I’m not typical Swedish. I don’t really fit in. This is not my country.” When I was a teenager, I was like, “Something is wrong with me. I don’t fit in. I’m not like everybody else.” So, I always knew that I wanted to explore and move on, but it was completely unexpected, the way it happened. Everybody loved the books so much, and the books were really big in Europe, so I expected people to just be furious. I felt like it was impossible to satisfy people, especially when they have such a strong inner picture and feelings about a character in a book. So, I was really surprised, when I started to realize that people really liked what I did and believed in my performance. And then, when I met Ridley Scott and he said to me that he’d seen The Girl with the Dragon Tattoo three times and that he wanted to work with me, it felt completely unreal, but also fantastic. The weird thing is that, with actors, filmmakers and directors, it doesn’t really matter if it’s Robert Downey Jr., who’s one of the biggest stars in the world, when you start to work, he’s a hardworking actor. At the end of the day, it doesn’t matter who’s a big star and who’s an unknown actor from wherever. It’s all about the work you do. With people that are really working hard, that’s what we always have in common. You can always meet each other and connect, in that way. It was the same with Ridley [Scott]. He’s one of my heroes. After a couple of days, we became really close and it felt like we were really working together as a team, searching for and discovering things. He’s so humble, so down-to-earth, so loving and just incredible. Then, the whole stardom and the circus around it disappears. Is it exciting for you to be a part of a big 3D summer blockbuster with Prometheus? RAPACE: It’s kind of crazy. I was doing ADR two weeks ago, in London, and it looks fantastic. I remember when I came into some of the sets, it just blew me away. It took my breath away, with the way they created it. We didn’t have green screen. I think we had it twice. They built everything. It felt like magic. It’s stunning. What’s so fantastic, with Ridley [Scott], is that he’s such an artist and he creates really big, amazing shots, but it’s still brutally beautiful, at the same time. I can’t wait to see it! I feel like my character is the heart in the movie. You follow her, and she changes. In the beginning, she’s a believer. She believes in God and she has a very strong faith. She is a scientist and an archaeologist. She’s on this mission, and she’s full of hope. In the middle of the movie, things happen and she changes into more of a warrior. And in the end, she’s such a survivor. It was really a quite intense and dramatic journey for me to go through, and to do with Ridley and the other actors. But, when we were finished and we wrapped in Iceland, I remember that it was almost like I came back to Earth because I’d been on this spaceship and I’d been out on this weird planet. It’s always quite fascinating, when I look back at things and I realize how deep into it I actually was. It’s almost like I’m occupied by something. What’s it like to be part of films that are so secretive, while there’s so much interest in them? Is it difficult to make sure things don’t get out about the roles that you’re playing? RAPACE: Yeah, sometimes. Sometimes you just want to go out and tell everybody everything because you’re just so full of happiness. It’s almost like you’re high on it and you just want to tell everybody about your experience, but you’re not allowed to say anything. You need to hold it back and force yourself to be quiet because you can’t share it with anyone. At the same time, I’m quite used to it. When I was doing the Millennium movies, I was hiding because they didn’t want anyone to see what I looked like. In the books, what she looks like is not really so specifically described, so I created the look of her and I was hiding for a year. Every time I went to something where I expected photographers or journalists, I wore hats and I was disguised, in a way. So, it was not only that I couldn’t say things, but I was hiding and staying away, as well. Do you know which project you’re going to work on next? RAPACE: I don’t know if it’s next, but in March, I will start this movie with Colin Farrell, called Dead Man Down. It’s a fantastic script. I might do a movie with Brian DePalma before that. I’m talking to him, and he wants to do this movie with me that’s a really, really cool script. It’s called Passion. I love Scarface and Carlito’s Way. He’s done fantastic films, and it’s been really interesting, talking to him. So, I might do that before, and then go do the movie with Colin. And then, after that, I have a couple of things, but I can’t really talk about them yet. Are you still doing The Last Voyage of Demeter, or is that not happening anymore? RAPACE: No, that’s not really happening now. I remember, when they wanted to do it, I was starting Prometheus, and Jude [Law] was doing something else. And then, they pushed it, and I don’t really know when it’s going to happen. How do you feel about re-teaming with your director for The Girl with the Dragon Tattoo, Niels Arden Oplev, for Dead Man Down? RAPACE: I’m actually seeing him tomorrow night. We’re going to sit and work on the script. I can’t wait! He’s fantastic! He’s a very brave director. I love working with him because we’re quite similar. We’re very passionate about what we do. Sometimes we were fighting about things, but we always came back to each other and we respect each other a lot. He knows me very well. It’s almost like he’s seen into my soul, and the darkest sides of me. But, I can’t wait to work with him again. He has this very rare thing, where he can tell stories that are complicated and with many layers, but he can open them up and make them visible and accessible. I think he has a gift where he can make them understandable for a lot of people. Some directors can tell stories and it becomes very intimate and small, and it’s almost like a secret. Some directors have the gift of finding a way to show it and tell the story, in a way that brings in the audience, and I think he has that gift. I can’t wait to start that with him again. With Sherlock being as open-ended as it is, and talk of a third film already having started, would you like to revisit Sim? RAPACE: Oh, I would love to work with those boys again. It’s been a fantastic journey. So, we’ll see. Absolutely, if they ask me.